The Ludington State Park offers snowshoe making classes every winter. The 2019-2020 Schedule will be posted when it becomes available. Classes are held at the Warming Shelter (unless otherwise noted) and are limited to participants 16 years and older. Instructor guide you through the steps to making top-of-the-line traditional wooden snowshoes that will get you through the deep snowfalls, and will last for generations. 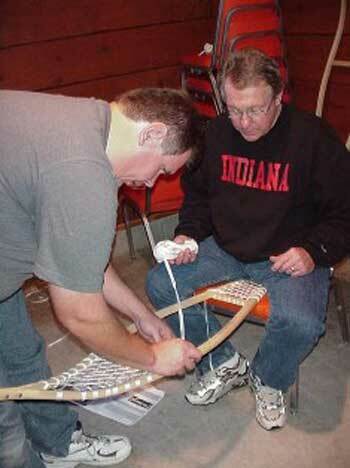 The cost for making a pair of snowshoes is around $200, which includes the pre-formed wooden frames, lacing, high quality bindings, personal instructions and lunch. When you are finished, you have snowshoes you can use throughout the winter, or give them away as a unique gift. During the warmer months, you can display them as a decoration. Snowshoeing is inexpensive and a great way to burn some calories while enjoying the outdoors. 2) Click on "Education and Outreach"
3) Click on "Outdoor Skills Academy"
4) Click on "Ludington State Park"
5) Click on "Snowshoe Making Clinic for December 8 & 9"
A Michigan State Park Recreation Passport is required to enter the park and may be purchased at the park. Residents may also now purchase the $11 Recreation Passport when they renew their Michigan license plate at the Secretary of State office or through the Michigan e-store at www.michigan.gov/estore.